MSD's Atomic AirForce Intake Manifolds increase airflow and distribution for improved performance on both stock and modified engines. The 2-piece polymer-molded design of the bell-mouthed runner entrances allows easy access to the runners for porting. These intakes accept an OE or 103mm throttle body and stock, aftermarket, or Atomic LS EFI fuel rails. 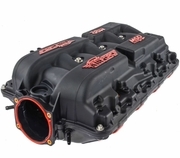 Atomic AirForce Intake Manifolds include new gaskets and hardware for easy bolt-on installation.